Goodreads Summary: It’s 1993, and Generation X pulses to the beat of Kurt Cobain and the grunge movement. 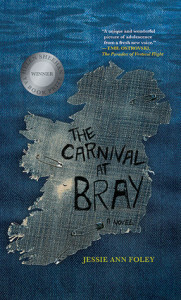 Sixteen-year-old Maggie Lynch is uprooted from big-city Chicago to a windswept town on the Irish Sea. Surviving on care packages of Spin magazine and Twizzlers from her rocker uncle Kevin, she wonders if she’ll ever find her place in this new world. When first love and sudden death simultaneously strike, a naive but determined Maggie embarks on a forbidden pilgrimage that will take her to a seedy part of Dublin and on to a life- altering night in Rome to fulfill a dying wish. Through it all, Maggie discovers an untapped inner strength to do the most difficult but rewarding thing of all, live. The Carnival at Bray is an evocative ode to the Smells Like Teen Spirit Generation and a heartfelt exploration of tragedy, first love, and the transformative power of music. The book won the 2014 Helen Sheehan YA Book Prize. Ricki’s Review: When I read the back of this book, I thought, “Hmm.” It felt like a (recent) historical fiction with its emphasis on ’90s grunge music and the highlights of Kurt Cobain’s life. Because my teen years spanned through part of the ’90s, I was intrigued. My favorite aspect of this book was the fact that the writing felt effortless. Too often, books’ messages or prose feel forced, and with this book, I felt as if I was whisked along for the (very bumpy) ride. As a former high school teacher, I enjoyed the myriad, richly realized themes. The reader feels a wild sense of adventure, the uneasiness that comes with living in a new environment, the loyalty that is tied with love, the heartbreak that emerges with loss and grief, and the utter purity that comes with finding oneself. At times, YA texts feature absent (or horrid) parents, but the complexity of Maggie’s mother was realistic to many parents, I believe. This will leave teens (and adults!) pondering their own relationships with their parents. The intricacies of this text will allow for book groups, students, and readers to have much to ponder and discuss. Teacher’s Tools for Navigation: This would be a great novel to discuss theme. As stated in my review above, there are many themes to ponder. I would put butcher paper around the room and write a different theme on each paper. Students could travel around the room, discussing each theme, placing post-it notes with evidence from the text. Or, the teacher might discuss a different theme on each day. Beyond the classroom setting, I think this would be an excellent selection for book clubs. Download the comprehensive study guide (from Elephant Rock Books) here. Discussion Questions: How does Maggie handle the challenges she faces? Do you think she makes the right choices? Is she brave? ; What does her uncle teach her? Was he an admirable character? ; What role does the setting (both time and place) play in this novel? ; Is Maggie’s mother a positive or negative role in her life? We Flagged: “But don’t you think that never suffering at all—is its own form of suffering?” (p. 150). I am not sure whether or not I agree with this quote, but weeks later, I am still thinking about it. Make sure to stop by Cinco Puntos Press blog to see the other stops on the tour!